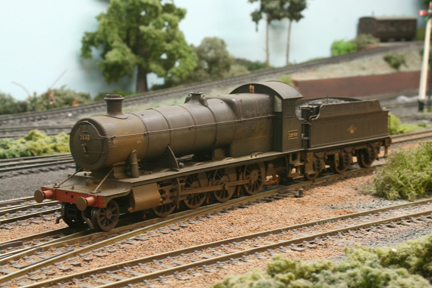 A trio of heavily-weathered Hornby 28XX models now. My brief from my customer was to make them all filthy, but differently filthy from each other. This goes to emphasize that weathering patterns can be as individual as the model, and does not have to mean that all one's locos have to look alike once weathered - indeed quite the opposite, as weathering is a perfect way of making sure your locos do NOT all look the same. All weathering patterns have been copied from colour photographs of actual locos, from various books in my library. No.2812 - just generally filthy really - typical late 1950s condition. No.2848 - still in GWR green livery (although wearing the early BR emblem), and still also sporting the square drop-down running plate ahead of the cylinders, with inside steam pipes. Weathered with a heavy dose of white staining around the safety valves and down the side of the boiler, to represent a serious bout of 'priming' at some point - quite common in the latter days of steam. No.2849 - typical of the run-down condition of these locos in the 1960s (if photographs in books in my library are anything to go by ! 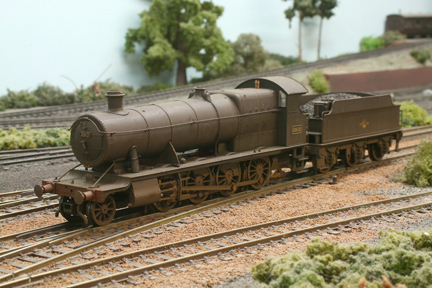 ), with much road dirt, and many rusty patches on the bodywork and under-footplate areas, including the smokebox and cylinders, where paint has peeled off due the heat, and no maintenance has taken place to rectify the situation. A Diagram 0.21 4-plank open wagon. Built from a Four Most Models kit. 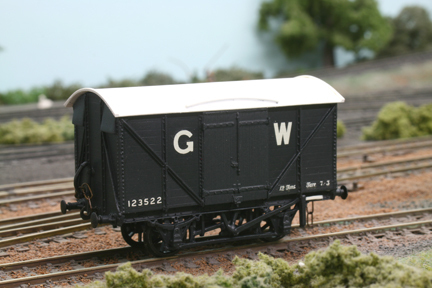 A 12 Ton 'Mink A' ventilated box van to Dia.V23 - built from a Four Most Models kit. This is a very sought-after vehicle. It is a 'Cordon' Dia. 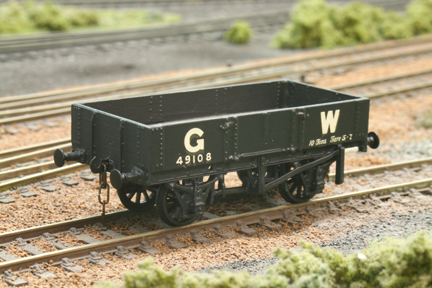 DD4 gas tank wagon. An etched-brass kit for this vehicle used to be available from Falcon Brassworks, but it has been out of production now for many years, and when they do occasionally appear on eBay, they can fetch quite high prices. This particular model is made from a 3D-printed kit, available through Wild Boar Models in the UK (but actually manufactured in Belgium by 3-D printing specialists Materialize). It comes as a one-piece printing, which has to be separated into three sections (underframe / platform, lower tank section and upper tank section), and after painting, simply glued back together again. NEM pockets are included in the design for tension-lock couplings, which makes life a little easier. 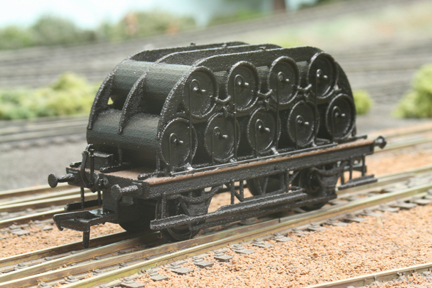 However, certain detail, such as the array of pipework fitted to one end of each of the nine transverse tanks (visible in the picture above) is not supplied, so this has to be fabricated by the modeller. On this particular model, I also fitted dummy coupling hooks to the buffer beams, and vacuum pipes. All in all, it makes up into a pleasing little model of this distinctive and unusual vehicle, at a reasonable price.